At the 2018 International Trade Fair for Skilled Crafts in Munich, Heinz Soyer Bolzenschweißtechnik GmbH was awarded the "Federal Prize for Outstanding Innovative Achievements in Trade" for the thirteenth time since 1989. 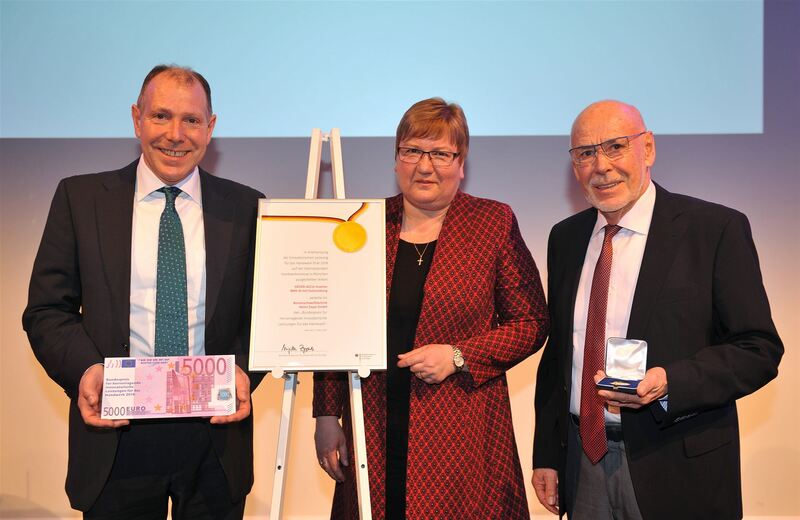 The two managing directors Heinz Soyer senior and Heinz Soyer junior were presented the award by Iris Gleicke MdB, Parliamentary State Secretary at the Federal Ministry of Economics and Energy on Sunday 11 March 2018. The BMK-8i ACCU mobile, battery-operated stud welding inverter exhibited at the trade fair was awarded the Federal Prize. This technical innovation is the world's first portable high-power rechargeable battery-powered stud welder with drawn arc ignition and SRM technology®, which has been specially developed for mobile and flexible use in assembly work without access to the mains and is suitable for stud welding up to a stud thickness of 8 mm (up to M10 when using the stud HZ-1R* developed by Soyer). Thanks to modern inverter welding technology, the device weighs only 8 kg and can be easily, comfortably and effortlessly carried even over long distances. If required, the battery of the device can be charged by a permanently integrated, intelligent charging module. This welding unit offers excellent welding properties, even in thin sheet metal processing. Thanks to the integrated SRM technology®, even thick studs on thin sheet metal can now be welded here without bulging inseparably, decoratively and safely. Welding is also possible without damaging the material even in difficult positions such as out-of-position welding. In combination with the PH-9 SRM12 standard gun, the gas consumption of the BMK-8i ACCU stud welder is only one-tenth that of conventional stud welders. This pioneering battery mobility in stud welding offers freedom of operation without a power cable, consistent high performance, flexibility in application and maximum energy efficiency. Further advantages for the user are freedom of movement while working, time saving due to the immediate readiness of the device for use, and increased safety at work, as there are no more tripping hazards caused by extension cables. 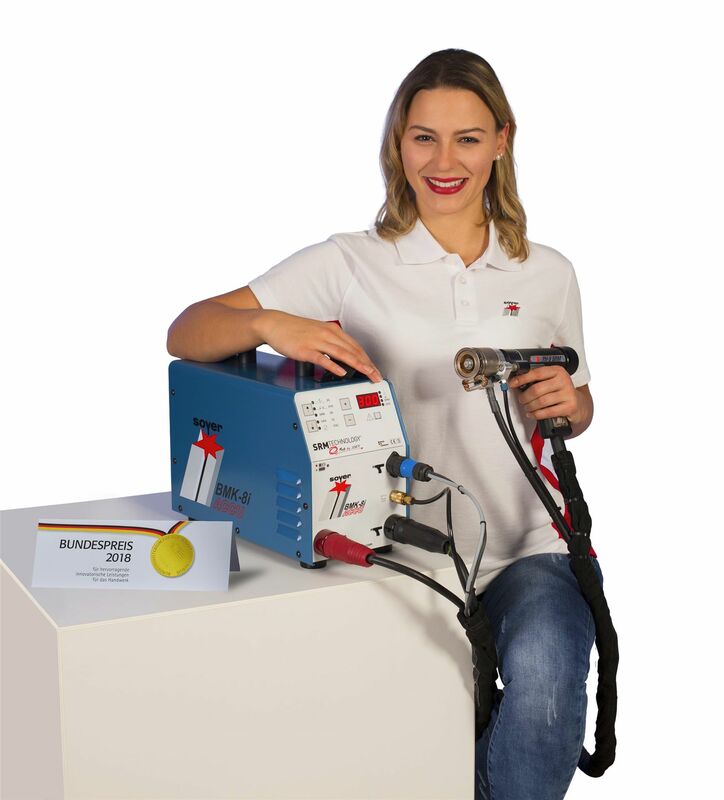 This makes the BMK-8i ACCU inverter stud welder with drawn arc ignition a compact and robust aid for daily use in production, repair and assembly.